(VEN) - The Spanish government officially provided EUR1 million in sponsorship to help Vietnam promote the development of solar energy. (VEN) - The EVN National Power Transmission Corporation (EVNNPT) said that it launched a 220kV-250MVA transformer on October 7 under the project to increase capacity of the Bac Ninh 220kV Transformation Station. (VEN) - The Cua Ong Coal Sorting Company has become well known for its responsible approach to coal extraction following its implementation of cleaner production measures for a sustainable coal industry. 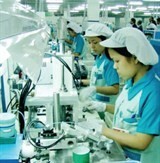 (VEN) - To fulfill this year’s industry promotion plans, Dong Thap Province’s Industry Promotion and Development Consultancy Center is implementing a number of measures such as closely monitoring on-going industry promotion projects, quickly handling arising problems and creating favorable conditions for the beneficiaries. (VEN) - As part of Hai Phong’s industry promotion plans in 2013, in late September, Hai Phong City’s Industry Promotion and Development Consultancy Center opened a fine art and sculpture woodworking course for 90 laborers of Thuy Trieu Traditional Woodwork Co-operative. (VEN) - Nui Beo Coal JSC is driven toward cleaner production (CP) and green mining, along with a planned investment in modern equipment and technology to boost production and environmental protection. (VEN) - In response to the slow progress of many industry promotion projects, the Agency for Regional Industry Development (ARID) under the Ministry of Industry and Trade called for industry and trade departments in 20 cities and provinces in the southern region to remove streamline processes and remove roadblocks for beneficiaries to ensure efficiency and achieve the year’s industry promotion goals. (VEN) - Circulating Fluidized Bed Boiler (CFB) is considered a useful solution for cleaner production in thermoelectricity plants. Thanks to CFB, dust coal can be converted into clean coal, contributing to bringing higher economic efficiency. (VEN) - Duong Huy Coal Co., Ltd. has applied effective and practical solutions in business and production activities to save costs through energy-saving solutions, improve competitiveness, reduce greenhouse gas emissions and ensure sustainable development.